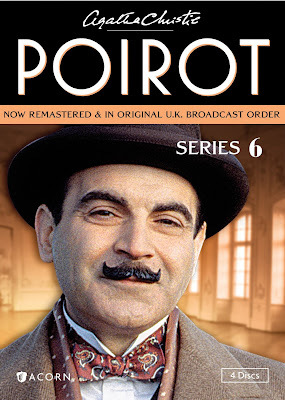 Since January of 2012, Acorn Media has been re-releasing all of the Poirot mysteries. This is pretty exciting since this is an excellent series that has been on the air since 1989 but this is the first time this series has been released in the US in its proper UK broadcast order and it has been completely re-mastered. I will get a little more into that later in this review but I realized very early on watching these episodes I was in for a treat. This ITV series started in 1989 with the episode The Adventure of the Clapham Clock and has been running ever since with its start David Suchet playing, to me, the definitive version of Poirot. It’s funny as most production companies that ever has a go at making any Poirot stories, they always seem to start off with Murder on the Orient Express just like if anyone wants to make a Sherlock Holmes story, they tend to make The Hound of the Baskervilles. For this series, Murder on the Orient Express did not air until 2010. The series is still going strong with its star David Suchet vowing to complete all the stories written by Agatha Christie. Of course, I assumed he would as he is, to me, the definitive version of Poirot. He will be finishing up very soon with the final episode Curtain. Something else that Acorn has been doing with these releases that commenced this year is that they released this series not only on DVD but Blu Ray too making this a very definitive collection of this series. 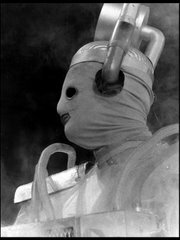 This set covers the 4 feature-length episodes from Series 6. On the DVD this is 4 discs with one story on each disc. The Blu Ray is a 2 disc set. The episodes covered in Series 6 are: Hercule Poirot’s Christmas, Hickory Dickory Dock, Murder on the Links, and Dumb Witness. If you have only heard of Poirot but never immersed yourself into this world, I don’t think you need to start from the beginning. I feel that you can pick up the series at any time. It’s all about loving a good mystery and finding a fascinating character to solve it. Poirot is all of that. Agatha Christie first introduced us to the Private Detective Poirot in 1920 with the novel. The Mysterious Affair at Styles and makes his last appearance in the 1975 novel Curtain although it was written in 1940 by Christie. She wanted it to be published after her death although it was in fact published just prior to it. Through the years, other people have played the role of Poirot such as Albert Finney and Peter Ustinov. 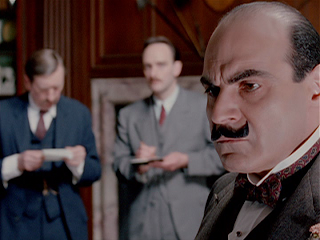 It was with Ustinov that Suchet played Chief Inspector Japp and later would take on the role of Poirot himself. The ITV series that started in 1989 was going to be different than anything we had seen before with a lot of attention brought to the dramatizations of the stories and exquisite detail to the era the series takes place in. Series 6 begins with Hercule Poirot Christmas (original UK airdate 01/01/95). 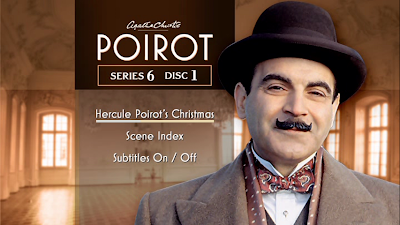 Poirot is looking forward to spending Christmas by himself and he is all set for a relaxing holiday until he gets a call from Simeon Lee who believes his life is in danger. Simeon has multiple grown children and has disdain for all of them. It appears there isn’t anything good about Simeon at all. Perhaps unsurprisingly, he is murdered; his throat slit. How can he be murdered in a room that was locked from the inside under the very mustache of Poirot? It is necessary for Poirot to get Chief Inspector Japp in to help him solve this case. One of the highlights for me is seeing the part of the butler Tressilian played by actor John Horsley who played Doc Morrissey in the BBC classic series The Fall and Rise of Reginald Perrin. This is one of those great Poirot episodes that take place in a country manor with the backdrop of Christmas hanging over the tragedy. It has an interesting way to depict the passage of time as the image of a desk calendar is super-imposed over the action telling us we are getting closer to Christmas. Out of a series of great episodes Hickory Dickory Dock (original UK airdate 02/12/95) may have been my favourite. This episode incorporates a youth hostel with a group of University students who are all not what they seem. 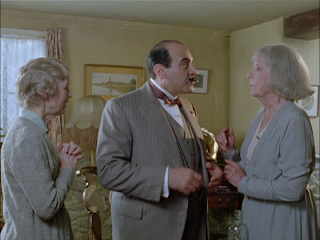 Poirot is brought in because his secretary, Miss Lemon, is worried. Her sister is running the hostel and there is a series of thefts in the house. Odd things are stolen like Stethoscopes, knapsacks, one shoe, etc. Why is this stuff being stolen and how does diamond smuggling fit into all of this? Unlike Hercule Poirot’s Christmas, which I figured out pretty quickly, this story has a ton of twists, turns, and miss-direction. There are some that are so clever that I couldn’t share without the risk of giving away the end of the episode. My only real criticism of the episode is that there is this attempt at symbolic imagery that takes place along with the rest of the action of a mouse running around the house. It’s mainly, from a distance, watching the action. I know that this plays in with “Hickory Dickory Dock, the mouse ran up the clock”, it does play into the action at the end but I felt that this was not done in a way that really connected it with the rest of the story. Plus, seeing this immediately made me to start making comparisons with the BBC series The House of Cards where so many shots had imagery of a rat which was a direct correlation of what is happening in that series made me wonder why they did it here as it wasn’t as successful. This episode is a ton of fun to watch and I think what really makes this interesting for me is the attention to detail. There are lot locations in this episode and just think about it. In a regular film shoot, great detail needs to be taken even if the shoot takes place in present day. 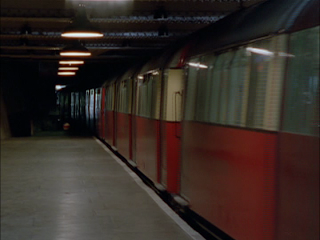 I can’t imagine trying to do a series like Poirot and take great attention to make sure everything looks like 1936. I am not expert on this matter and I am sure some liberties are taken but I am satisfied with the overall look and feel of these episodes. A great example is a scene that takes place in the London Underground. The trains used are beautiful and antique. It gives a real good taste of what it might have been like back then. It’s gorgeous. Guest stars include a young Damien Lewis who plays Leonard Bateson and a personal favourite of mine, David Burke, who played a wonderful version of Watson in The Adventures of Sherlock Holmes. Murder on the Links (original UK airdate 02/11/96) has a great start. A lot of shows or movies that are period pieces start with “newsreels” to set the stage for the action. This episode does that too but does it from the stand point of a group of people making the newsreel and announcer recroding the VO for it which clues us in to the background of the story. It’s essentially the same thing but done in a way to make it fresh. I have never seen it done that way before. Poirot and his close friend Hastings take a vacation to France where Hastings secretly books them in a hotel that caters to the golf enthusiast which Poirot is anything but. Poirot has little to worry about as he is soon caught up in a case of murder. Once again, many suspects with many angles. This case has roots that go back 10 years previous to when Poirot gets involved. The stakes on this case becomes higher as Poirot does not have the luxury of working with someone like Chief Inspector Japp but he has to work with Monsieur Giraud who believes he is the best detective in France. So much so that Poirot and Giraud wager a bet to see who solves the case first. If Poirot wins, he gets to keep Giraud’s famous pipe that he smokes everywhere and if Poirot loses, he has to shave his trademark mustache. Is Poirot clean-shaven by the end of the episode? The final episode of Series 6 is Dumb Witness (original UK airdate 03/16/96). Poirot and Hastings go to England’s Lake District to see Hasting’s old friend Charles try to break the world speed record for a motor boat racing. As with Hercule Poirot’s Christmas and Murder on the Links, money is a factor in this episode. Emily Arundell is very rich and there have been some attempts on her life. Even after she changes her will to keep her wealth away from her family, she is murdered. Only one individual knows what happened and he’s not going to speak anytime soon. This is another great episode with some fantastic location shots. There are not as many locations as in Hickory Dickory Dock but the story is shot very well making great use of the surrounding locations and the natural beauty of the lakes and old-fashioned houses in the area. Just like in some of the other episodes, there are some faces I recognize such as Julia St. John who played Laura in the BBC comedy The Brittas Empire and Jonathan Newth who has been in many series including playing the role of Dr. Soames in the 1981 adaptation of The Day of the Triffids which I just wrote about recently. 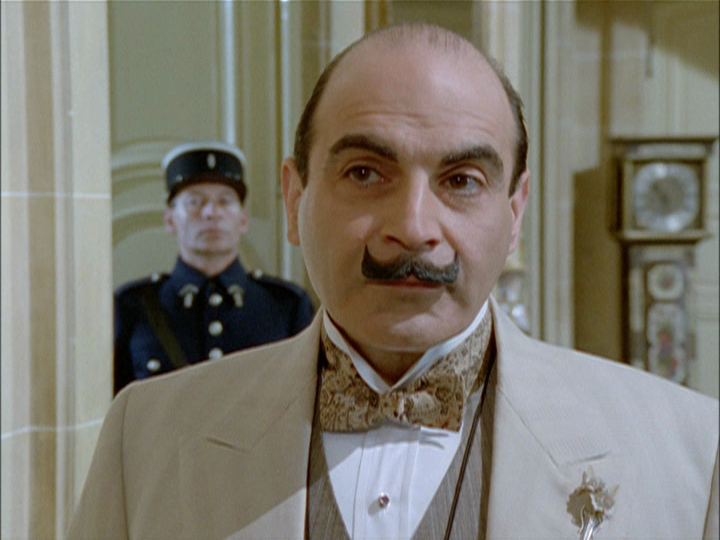 There is not much to say about David Suchet’s role as Poirot that isn’t already known. He is enchanting and quite honestly amazing. The character Poirot himself is someone who can be amusing and very serious at the same time. For a smaller unassuming person, Poirot has a way to get a great deal of respect from everyone he works with and if they don’t initially respect him by the time they are done with him they will. I really enjoyed in Murder on the Links, Poirot’s attempt at understanding the game of golf. At one point he asks Hastings if he is going to play a “circle” of golf instead of a “round”. At the end, he once again tries to show interest in the game by asking Hastings if he plans on improving his “disability” instead of “handicap”. Back in 1995-1996 when these episodes were made, the production process for these series often followed shooting on film, transferring to video and editing it on video for the final product. It is essentially done the same way today but there are a couple of major differences. First, the process of telecine which is transferring of film has evolved very much through the years to get a better picture than ever possible before. Secondly, programs today are produced in HD. 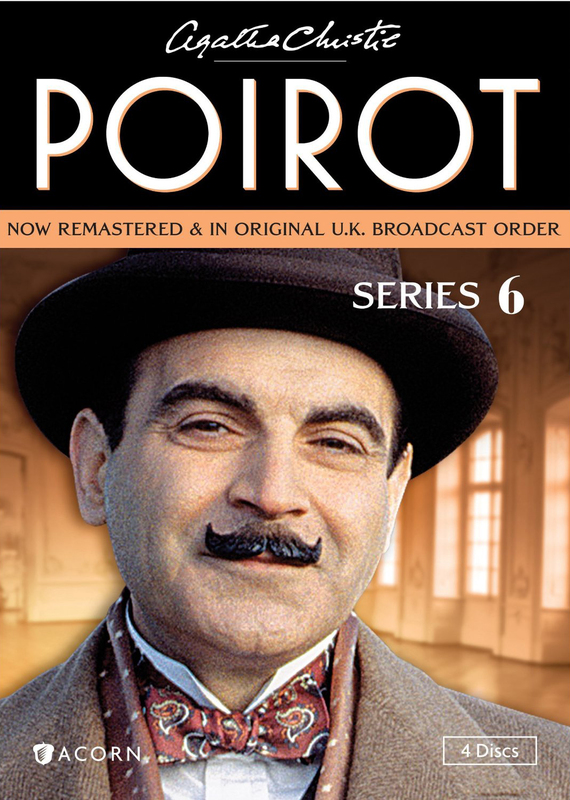 Because of how Poirot was made, this series can benefit from the advances in technology. It appears that all of the film exists for these episodes and they have been re-transferred to HD and re-assembled. Unfortunately, I was not sent the Blu ray set so I cannot comment on how this looks in HD. I will try to get some examples or the set from Acorn because I am interested to see how this looks in HD. I watched the DVD and I think it is clear that it is a re-transfer. The image is very crisp. I looked at some of the older releases of Poirot from years ago and it is very clear these new transfer are very clean and very pleasant to look at to my eye. The one thing I might have a criticism about is the colors. For the first 3 stories on this set, I felt the colors were very cold and pale. I would have liked to see some warmer colors in the transfers but these might be consistent to how the director wanted them to look when the production was originally done. The colder color grading worked well for Hickory Dickory Dock as it felt natural to me for its art deco setting but it feels out of place for Hercule Poirot’s Christmas. Yet in Dumb Witness, work had clearly been done on the grading of the episode. There are shots by the lakes and at country houses that really benefit from the new transfer. Take a look at the skied in that episode you can see what I mean by the color grading. There are no extras on this release and maybe there have been on some of the earlier ones. I like extras but I honestly don’t see them essential for every release so having none here is not an issue for me. I know you should never judge a book by its cover but I am a fan of owning the DVD or Blu Ray medium. So for me, the whole experience of the program and the packaging it comes in are important. I think the packaging for the whole Acorn re-release of Poirot is really very smart and effective. There is a nice house style that has a “classy”, for the lack of a better term, look to it. Each cover in the range is a picture of Poirot with some kind of background like a large room. It is obvious that the picture of Poirot is a from a screen grab cut out in front of a background but that’s fine. The Series 6 set comes with an outer sleeve that is very nice and copper colors are of a reflective material that looks nice on the shelf. I would imagine the whole series done this way would be really nice looking on the shelf. The DVD case itself is standard size that is a “flipper” that holds all 4 discs. It makes it a nice size to store. This is a great set. It just has the episodes but I think that is fine. Work has been done to make them look as good as they can and the pricing for the DVD and Blu ray sets are reasonable. 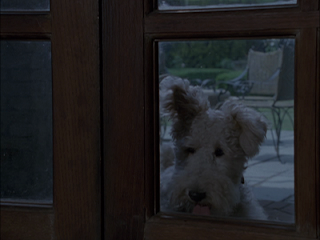 If you have not seen Poirot before, I don’t think you need to start at the beginning. Picking up this Series 6 release is just as good of an introductory into the world of Poirot from the 1930s as anything else.